Sam has been a Licensed Physical Therapist since 2009 and joined our PT Link team in 2014. He holds both a Doctorate in Physical Therapy (2009) and a Bachelor of Science in Exercise Science (2006) from The University of Toledo. During his time at The University of Toledo he developed a Clinical Practice Guideline for Upper Extremity Musculoskeletal Disorders and contributed to research pertaining to the influence of inflammation on muscle hypertrophy which was published in the American Journal of Physiology and Cell Physiology. 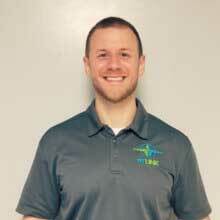 Sam is a NSCA Certified Strength and Conditioning Specialist and has earned certifications in Dry Needling and High Velocity Low Amplitude Manipulation. He has completed the ImPACT concussion training workshop and is an APTA Credentialed Clinical Instructor. Clinically, Sam focuses on helping patients move better to live a pain-free life. He uses a wide variety of manual therapy techniques and corrective functional exercise to reduce common movement and posture dysfunctions that lead to pain. Sam also has extensive experience in sports medicine, orthopedics and working with patient that suffer from neck and back pain. Sam is married to Holly who is also a PTA at PT Link. They recently welcomed their first child Ben. Sam enjoys spending time with his family and friends, playing sports, exercising, hunting with his dad and is an avid fan of the Pittsburgh Steelers and Ohio State Buckeyes.